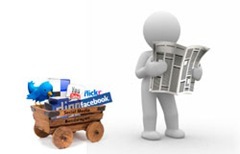 Welcome to the January 2010 edition of Social Media Monthly Round Up. In recent years the web and especially social media has started a communication revolution that has changed the way we live and work on web. Since its birth and over the last few years when it has grown in both stature and reach, social media has become all-encompassing. Now more so to the extent that we can say that it is more than just sharing information. Realizing social medias real power Google has integrated Social Search within its interface. Most people are using social media to offer their interests and opinions, their ideas, theories and whatever they feel worth sharing to the online community. For this reasons it is clear to see how social media among online users is skyrocketing and content is become incredibly topical. 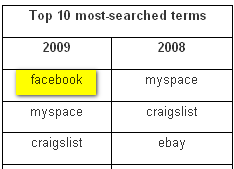 According Hitwise study report “Facebook” is the top search term in 2009. In fact, four variations of the term "Facebook" were among the top 25 terms. 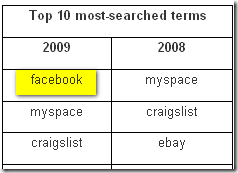 Facebook moved up from the 10th position in 2008 to the top position in 2009. Looking at the trend you can see that no social marketing site has grown as fast as Facebook over the last year. We can also see that MySpace has declined while Twitter while still below MySpace has had a reasonable surge as well. Comparing Facebook, Google & Yahoo! Think Facebook is just a fad? Think again! Look at the dramatic improvement made by Facebook in just one year! Facebook is virtually identical to Yahoo! and not very far behind Google. At this rate we should see Facebook overtake even Google at some point in 2010. Twitter has enhanced the feature 'Twitter Trends' by adding Local Trending Topics. Currently this new feature is available to selected countries. Twitter is planning to extend this feature globally in the future. 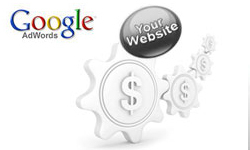 Delicious has integrated StumbleUpon-like features to its bookmarking options. The new updates include a revised filtering option, a new way to browse your bookmark and a new display option menu on the top right corner of your bookmarks display. It is reported that Google founders Larry Page and Sergey Brin are planning to sell approximately 5 million shares over a period of five years. Kaboodle, the social shopping site and a property of Hearst Corporation has undergone an upgrade that transitioned it to a better discover engine allowing online shoppers to search for, browse and interact with millions of products. David Sacks, the founder of Geni and Yammer has joined as new board member of Scribd the social publishing site. Hakia, the internet search engine has launched a new search site NoBrandSearch.com which provides two sets of results each time you search. They're chosen from four search engines: Google, Yahoo!, Bing and Hakia. That all in this edition folks. Nice monthly segment which gives us a quick glance over the major occurrences in the online world. Facebook 's effort to make its interface more functional and user friendly is laudable. No wonder why it has climbed up on top of the social media world! Very true Jay, within a short span of time Facebook has grown from a simple social medium to a much defined business utility facilitator. And what you have said is 100% right "They've got almost everything under one place." That's why people are sp interested in using Facebook. It's no wonder facebook has improved tremendously and are on top of searched keywords because they offer all kinds of features by which we can share and post information like creating profile page, albums, uploading videos, games, events, creating groups and causes etc. They've got almost everything under one place. 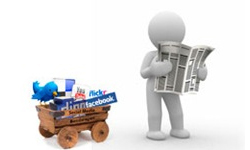 Moreover facebook is well used for marketing purpose as it will get listed on search engines quickly. Thanks Asha for Social Media updates.